HSTOnline - How Does it Work? HSTOnline is a powerful tool that will allow you to streamline your homeschooling planning and record-keeping needs. There are many features - and you will decide which ones are best for you. It is unlikely that you will every single feature available in HSTOnline. You'll want to become familiar with the different features so you can choose which ones will most enhance your experience with the program and your planning and record-keeping needs. HSTOnline allows you to enter every single task your Student attempts, or you can choose to enter only those items which will be graded, or you can enter just enough minimal information to generate a grade for a Report Card or Transcript. If you prefer a more un-schooling or child-led environment, check out our Tips for Unschoolers page. In series - create a group of Assignments for one or more Students where each Assignment has the same information or where the Page/Lesson/Chapter details follow a sequence that you set such as: Lesson 1, Lesson 2, Lesson 3, or Pages 1-5, Pages 6-10, etc. Type a new entry into the field. When you save the Assignment, HSTOnline will automatically add the entry to the appropriate 'Manage List'. Grading is completely optional in HSTOnline - you can grade every single Assignment, selected Assignments, or none at all. Enter the points possible for the Assignment - this can always be 100 if you want, or it can be the number of questions/problems in the assignment, whatever value you choose. Term grades are generated by dividing the total points earned for all assignments by the total points possible for all assignments in that Term, essentially treating all the individual Assignments as one single Assignment. Visit the Grading Overview page for any Student to view a snapshot of your Student's progress for a selected School Year. The Grading Overview shows how term grades have been calculated and can help you determine why a grade listed in a Report Card or Transcript is different than what you expected. While in the Grading Overview area, you can also add or edit Assignments to affect changes to the Student's grades. It takes just one graded Assignment in order to generate an entry on a Report Card or Transcript. This makes it easy to develop reports for previous years of homeschooling. Of course, you can also create detailed records throughout the school year to create a comprehensive record of the Student's work. Report Cards can be created for any single School Year; Transcripts can be created for any one or more School Years. Attendance records can be entered manually, or they can be generated automatically based on the completed Assignments for a given date. mark any date as Present, Present 1/2 Day, or Absent. The Lesson Plan feature (often referred to in this Help File as 'LP') is for those who like to see everything planned out in detail at the beginning of the year or term in one or more areas of study. Creating a Lesson Plan allows you to figure out all the details of the work you wish to assign - explicit directions, combinations of assignments that go together, and the specific pages, lessons or chapters to be assigned. You can create as many different Lesson Plans as you like. If you're not much for planning, check out our Tips for Unschoolers page. Lesson Plans are not tied to a particular student, so you can use them over and over again throughout your homeschooling career. You can plan out the work you will be assigning without committing to any particular dates. This means that you can submit the work to the assignment grid just before you're ready to assign it - whether that's a day, week, or month at a time. It's up to you. That way, when things take more or less time that you expected you don't have to waste a lot of time rescheduling things back and forth. After you have enter your Lesson Plans, you can use them to create Assignments using the HSTOnline Scheduler tool. You can create Assignments from one Lesson Plan for one or more Students at a time, or you can create Assignments for one Student from multiple Lesson Plans at a time. When creating the Assignments, you can set a Daily, Weekly, Monthly or Spread Evenly pattern, or use the Presets you've created for each Student. The Skills feature allows you to create and track a list of learning achievements or other mileposts that you set for your student which can be designated by grade level, school year, discipline, etc. Once you have created some Skills, they can be linked to Assignments and Lesson Plan items. Linking Skills to Lesson Plan items will automatically attach them to Assignments created from these items. For instance if you have a Skill for your 3rd grader regarding 'working with fractions through weights and measures', you can tie that Skill to any Assignment dealing with that skill set - whether that is a Math Assignment or a Life Skills Assignment. The Student - Skills Progress page shows you all Skills which have been attached to one or more Assignments for that Student within a selected School Year. On the Skills Progress page, you can mark a Skill as Completed and/or you can add notes regarding the Student's progress in that area. A Skills Progress Report can be generated to show progress and completion of selected Skills for each Student. Use the easy ISBN/ASIN entry system to create a list of books and other resources used in your homeschool. You can classify your books by author, publisher, grade level and/or type and add additional notes to any library entry. 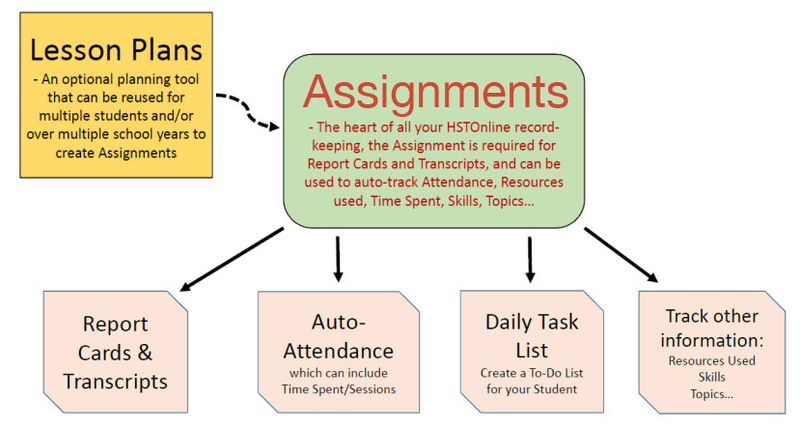 You can create Assignment lists, Report Cards, Transcripts and more in HSTOnline. All Reports are generated as PDF documents which you can then save, print, email or do perform any other action as you would with any PDF document. In addition to various formal reports, you can export lesson plan, library and agenda data into a .CSV file which you can then manipulate in any way you choose. As the Administrator of an HSTOnline account, you can set up User Accounts to allow another Teacher and/or your Students to access your database. With the standard package, you can have one Administrator (full-access) account, 3 Teacher accounts, and up to 20 Student accounts. Add Chores and/or Appointments into your Student's schedule to give them a well-rounded view of their day orweek.